Aerial Photos of Belize Atolls - "Our Belize Vacation"
BELIZE'S ATOLLS - What is an Atoll? An Atoll is a ring-shaped coral island or string of coral islands, consisting of a coral reef that surrounds a lagoon. Belize has three Atoll's located off it's mainland, just outside (or beyond) the Barrier Reef. These make excellent sites for snorkeling and/or diving. Belize offers over a 100 diving sites, not to mention the multiple sites which have yet to be explored and three off shore Atolls, one of which contains the famous Blue Hole (discovered by Jacques Cousteau in 1972). 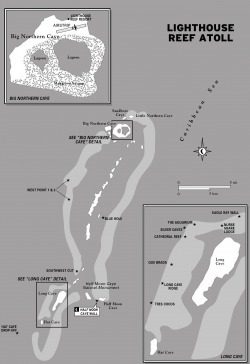 Lighthouse Reef Atoll includes the Caye cluster of: Northern Two Caye, Half Moon Caye, and Long Caye. It is located 50 miles southwest of Belize City. Lighthouse Reef is a 40 mile preserve and one of the most exotic dive spots in Belize. 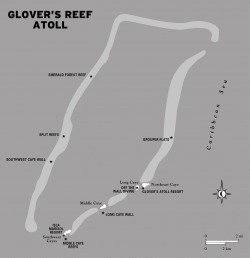 It is the only atoll with a private airstrip and the nearest atoll to the Blue Hole. Looking from the air like a dark blue vacity in a field of turquoise, this almost perfectly circular underwater cave is Lighthouse Reef's most spectacular natural wonder. The cave measures 1,000 feet in diameter and 480 feet deep, and was made famous by Jacques Cousteau, who explored the fascinating site in 1972. The Blue Hole is perfect for the seasonal scuba diver or snorkeler, and is one of Belize's signature dive sites. Other spectacular sites include the Half Moon Caye Wall, at the southern end of the Atoll. At the southeast corner of Lighthouse Reef is the 45 acre Half Moon Caye Natural Monument, the country's first national park (1982). It is home to reptiles, turtles, and a large diversity of birds, including thousands of red-footed boobies. The only other similar booby colony is on the island near Tobago. Turneffe Island Atoll includes the Caye cluster of: Crawl Caye, Blackbird Caye, and Caye Bokel. It is located about 25 miles east of Belize City, the Turneffe Atoll is the largest of Belize's three atolls. It is home to several small, pristine cayes accented with palm trees, white beaches and mangroves. Only a few hundred yards from the Barrier Reef, the islands offer excellent diving, snorkeling and fishing opportunities. 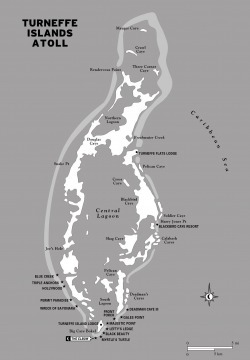 Which includes the Caye cluster of: Northern Caye, Long Caye, Middle Caye, and Southwest Caye. It is located 70 miles southeast of Belize City, it is one of the most remote of all the Atolls. Once the base of Pirate John Glover, this island now is a paradise with pearly white sand beaches. Brilliant blue waters in the 80 square mile lagoon are dotted with some 700 patches and surrounded by 50 miles of sheer drop offs ranging from 40 to 2,600 feet long. Excellent scuba diving, snorkeling, fishing, kayaking and camping are all available here. It is southernmost of Belize's triad of atolls and the least frequently dived.